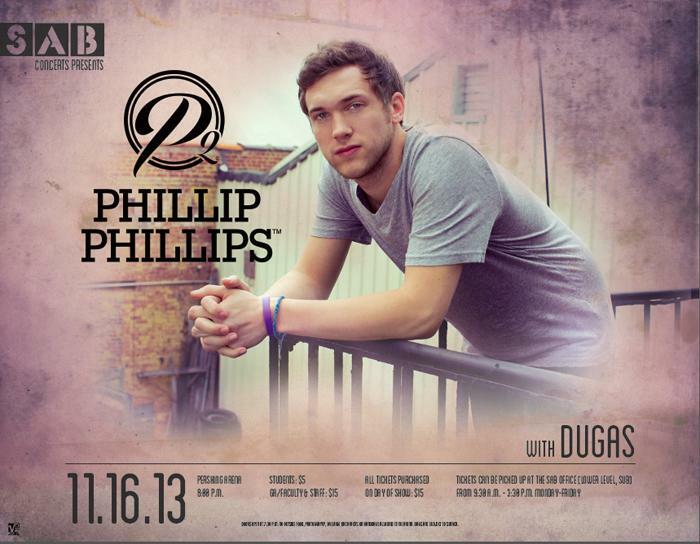 American Idol winner Phillip Phillips will perform at 8 p.m. Nov. 16 in Pershing Arena. Fresh off his first headlining tour, Phillips is now bringing his brand of rock-and-roll to arenas around the country as the opening act for singer-songwriter superstar John Mayer. Doors will open at 7:30 p.m. Tickets are $5 for students and $15 for general admission, and are available in the Student Activities Board Office in the lower level of the Student Union Building. All tickets purchased on the day of the show will be $15. The University’s Theatre Department will perform their second production of the season, entitled “Blood Wedding,” at 8 p.m. Nov. 13-16 in the James G. Severns Theater in Ophelia Parrish Hall. “Blood Wedding” is a poetic, lyrical tragedy of love, fate and revenge, set against the Spanish landscape of Andalusia. It tells the story of a couple preparing for their wedding day, while the bride is still in love with another man, and the events that unfold throughout the performance. Jon Ginder, senior music student, composed two of the production’s songs. Madison Chambers and Bailey Jones, theatre students, also composed choreography throughout the production. Student Rebecca Grow will play the synthesizer, and Robert Graber, professor emeritus, will play the classic guitar. The production is free, and it is requested to reserve tickets in advance. Tickets can be reserved at the box office in the lobby of Ophelia Parrish from 12-4:30 p.m. Monday through Friday, or by phone at 660.785.4515. The Forest Lake Area Trail System (FLATS) received the “Community Partner of the Year" award and was recognized at the Community Partner Appreciation Luncheon, Oct. 29. Daniel Martin accepts the Community Partner of the Year Award for FLATS from SERVE Center staff member Mary Beth Myers (left) and Mamie Cox, student coordinator of the SERVE Center. FLATS was nominated by Alpha Phi Omega, a service organization at Truman. FLATS and Alpha Phi Omega have worked together through Dan Martin, the volunteer coordinator for FLATS. Martin has contacted Alpha Phi Omega when FLATS needed help clearing brush from the trail, and multiple APO volunteers would help clean up the trail. For more information about the FLATS program, visit kvflats.org. Truman will celebrate its first ever Tag Day, an event to recognize the impact of donations to the University, on Nov. 15. Tags will be placed across campus to identify items provided as gifts to the University. Examples of donated items that will be tagged include computer labs, audiovisual equipment and SMARTBoards, among others. However, some larger items are more difficult to tag, such as horses donated to the University Farm. According to Equestrian Team coach and horsemanship instructor, the University Farm has had eight horses donated to the program. Students are encouraged to help celebrate Tag Day Nov. 15 by stopping by the table in the Student Union Building and writing a thank you note to a Truman donor. Horses pictured from left to right: Mouse, Quick, Atticus, AJ, Goldie, Gypsy, Etta and Reno. As of Nov. 5, the Truman community has contributed more than $39,000 to the United Way Campaign, representing 73 percent of the University’s $54,000 goal. However, there is still time to make a donation to help reach the University’s goal. Donations can be sent to Pam Ryan, Department of Mathematics. For a pledge form, contact Pam Ryan at pjryan@truman.edu or Maggie Herron at mherron@truman.edu. The annual Holiday Market craft fair at Truman is quickly arriving and sponsors are looking for vendors who would be interested in selling their crafts. Holiday Market, taking place from 9 a.m.-5 p.m. Dec. 7 in the Student Union Building, is an indoor craft fair sponsored by Alpha Sigma Gamma service sorority that benefits Victim Support Services, a non-profit organization supporting victims of crime including domestic and sexual violence. The fair is open to the campus and community. It will cost $35 to reserve a table and all of the profit that is made that day is the vendors to keep. Lunch and set-up/tear-down assistance will also be provided for vendors. Other events taking place at Holiday Market include live music featuring student music groups and local bands. Kids are also welcome and organizers will have a play area where children can be supervised as parents shop. The play area will have Christmas movies and activities, as well as an appearance by Santa Claus. Photographs with Santa Claus for children 12 and under will be provided, a donation of a canned good or toiletry item is appreciated. Anyone interested in being a vendor at the Holiday Market can contact Emily Berry and Melissa Tran at holidaymarket1@gmail.com or call 314.304.2531 by Nov. 15. Information sessions about the Experience the Middle East study abroad course, MDST 300, will be at 6:30 p.m. Nov. 18 in McClain Hall 209 and at 4 p.m. Dec. 11 in McClain Hall 212. 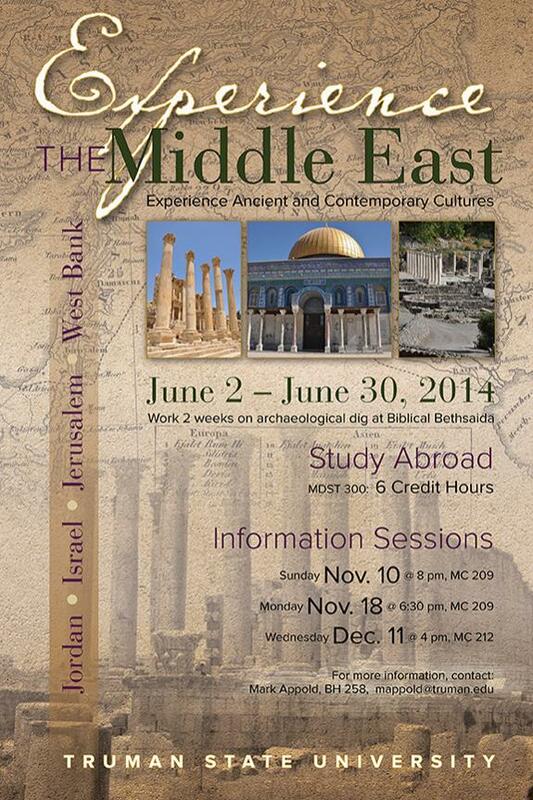 The study abroad course will consist of visiting ancient and contemporary cultures in Jordan, Israel, Jerusalem and the West Bank, and archaeological work at the ancient Bethsaida. For more information, email Mark Appold at mappold@truman.edu. The Office of Student Research is now accepting Grants-In-Aid-of-Scholarship and Research (GIASR) applications for research and creative scholarship to be conducted during the spring 2014 semester. All disciplines are invited to participate. The purpose of these grants is to promote a culture of research and scholarship at Truman while proving flexibility to accommodate different research styles and requirements. Projects supported by this program should involve original ideas but may encompass a variety of activities including obtaining preliminary data or information, exploring new topics and continuing ongoing projects. The OSR plans to award up to seven GIASR in the amount of $750 each. For more information or questions, email osr@truman.edu. The Department of Public Safety will have different hours over Thanksgiving break. Resume regular hours, 7:30 a.m.-10 p.m.
Alpha Chi Sigma is hosting a public tie-dye from 3-5:30 p.m. Nov. 15 in Magruder Hall 1027. Students should bring their own shirts and $5 to tie-dye. For more information, email cfh2216@truman.edu. 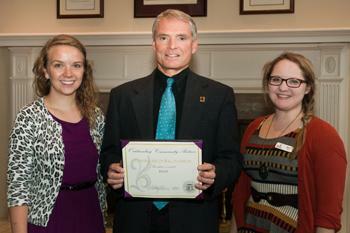 Truman State University will celebrate Family Day Sept. 13, 2014. All future updates to the Family Day schedule will be posted at about.truman.edu/family.asp. Visitor information can be found at about.truman.edu/visit.asp. For questions, call 660.785.4016. The Sheila C. Johnson Leadership Fellowship aims to bring together emerging leaders working to address disparities in underserved communities through efforts in healthcare, education, economic development, public policy, criminal justice and more. Each year, the Fellowship selects up to ten recipients to receive full tuition, health insurance, and a $10,000 stipend for a full course of study at Harvard Kennedy School. All admitted degree program students are eligible. Interested individuals should first apply to Harvard Kennedy School by Dec. 4. For more information about applying to Harvard Kennedy School please visit hks.harvard.edu/admissions. For additional information about the Fellowship, please visit hks.harvard.edu/leadership. Two summer internships are available for Truman students during the summer of 2014 at the Truman Presidential Museum and Library in Independence, Mo. The position is an eight-week, 40-hour per week internship, coinciding with the University’s summer break. Each student will receive a scholarship to cover five hours of internship credit, and the position is unpaid. Applications are due Dec. 6. For more information, contact Jeff Gall at jgall@truman.edu or 660.785.7747. As a collegiate correspondent, students will write one article per week for USA Today College, providing a unique angle on current news. Collegiate correspondents are able to choose their topics as long as they are newsworthy and current. Correspondents will have the opportunity to work with the USA Today College editorial staff for guidance and writing support, and a stipend of $350 will be awarded for successful completion of the program. The first round of applications will open Nov. 11-25. Selected students will move on to the second round of applications, which runs Dec. 6-9. Chosen applicants will be notified Dec. 16, and the spring 2014 term runs Jan. 13-May 9. For more information, visit usatodayeducate.com/correspondent. The Multicultural Affairs and SERVE Center are looking for 250 Truman students, faculty and staff to spend Jan. 20, Martin Luther King, Jr. Day, completing service projects across Kirksville. To sign up, visit truservice.truman.edu. An exhibit featuring John James Audubon and his classic work, “Birds of America,” is currently on display in the library gallery. Also featured is Jason Luscier, assistant professor of biology, and his research on bird mortality by window strikes. Michael Bump, professor of music, will perform as a guest faculty soloist with the Truman State University Orchestra at 8 p.m. Nov. 16 in Ophelia Parrish Performance Hall. He will perform Georg Druschetzky’s Concerto for Six Timpani and Chamber Orchestra. The performance will shed light on the early performance practices and compositional experimentations of solo timpani writing within orchestra. Carter Datz, sophomore music composition major, received second prize for his composition titled, “Synecycle” for organ and percussion from the Seattle Chapter of the American Guild of Organists (AGO). The composition will be premiered next spring at a Seattle AGO recital. Datz received a $750 prize for his entry in the Seattle AGO Organ rEvolution Competition. Jerrold Hirsch, professor of history, presented, “Lizzie labels, Folklore Theory, and Popular Culture in the 1920s,” and chaired the session, “Folklore as a Discipline, Policy, Boundary, History,” in October at the annual meeting of the American Folklore Society in Providence, R.I.
Sylvia Macauley, professor of history, had her co-edited book titled, “Paradoxes of History and Memory in Post-colonial Sierra Leone,” published in October 2013 by Lexington Books. Nelson Ugwu, senior biology major, received the award for “Best Undergraduate Research Presentation” Nov. 2 at the 5th Annual Interdisciplinary Biomedical Research Symposium at A.T. Still Research Institute. The event gave students, residents, faculty and regional researchers the opportunity to present their current biomedical research. Ugwu did his research during his internship at the University of Michigan Cardiovascular Center this past summer. Truman’s telecounseling program is hiring for the spring 2014 semester. Applications are due by 5 p.m. Nov. 11 in the admissions office. For more information or to turn in an application, email karah@truman.edu. Applications are available here. The National Science Foundation Discussion will be 6-8 p.m. Nov. 11 in the Student Union Building Alumni Room. Dr. Schroeder from the National Science Foundation will present about applying for grants from the NSF that can be useful for students from a variety of majors. SAB presents Last Lectures at 7 p.m. Nov. 12 in the Student Union Building Georgian Room B. Teresa Heckert, professor of psychology, and Madeline Nash, coordinator of ResLife, will give lectures answering the question, “If this were your last lecture, what would you say?” Admission is free and refreshments will be provided. An Academic Professional Development Club lunch will take place 11:30 a.m.-12:30 p.m. Nov. 13 in the Student Union Building Georgian Room A. Dana Vazzana will present “The Power of a Good Syllabus.” Lunch will be served - RSVP here by Nov. 8 to be included in the lunch order. The Physics Colloquium will continue from 4:30-5:30 p.m. Nov. 13 in Magruder Hall 1000. Reza Montazami from the Department of Mechanical Engineering at Iowa State University will speak about stimuli responsive advanced functional materials. Joe Benevento, professor of English, will give a reading from his ninth published book titled, “The Monsignor’s Wife” at 7:30 p.m. Nov. 13 in the Student Union Building Alumni Room. For more information on the book and Benevento’s writing, visit AuthorJoeBenevento.com. An Art of Meditation Introduction will be from 7:30-9 p.m. Nov. 14 in McClain Hall 210. The introduction explains meditation and its benefits. The Truman Biology Department will sponsor a large surplus plant sale from 9 a.m.-4 p.m. Nov. 15 at the University Greenhouse on Patterson Street. Most plants are $5 or less and include orchids, bromeliads, cacti, succulents, palm trees and many other house plants. All funds will be used for operational costs of the University Greenhouse. The deadline to sign up to stay on campus over Thanksgiving Break is 5 p.m. Nov. 15. For more information, click here. Truman’s Jazz Ensemble will perform Duke Ellington’s jazz interpretation of “The Nutcracker” by Pyotr Ilyich at 4 p.m. Nov. 17 in Baldwin Hall Auditorium. A World Language Conservation Luncheon will be from 11 a.m.-2 p.m. Nov. 18 in Ryle Hall Room 1302B. John Smelcer will be speaking about how he is one of the last speakers of the Ahtna Athabaskan language, and what he is doing to conserve the language. Limited seats are available. RSVP to emmanuelc@truman.edu. The Muslim Students Association is hosting a Taste of Islam dinner from 6-8 p.m. Nov. 19 in the Student Union Building Georgian Rooms B and C. Discussion will include empowerment of women in Islam. In addition to a presentation, there will be a meal and performance by Muslim actress Rohina Malik. Sponsored by the FAC. An Adult Evening of Shel Silverstein, a production by the new theatre majors seminar class, will take place at 8 p.m. Nov. 19 in the Severns Theatre. There is mature subject matter throughout the performance and is not suitable for children. Admission is free, and tickets can be reserved in the theatre box office in the lobby of Ophelia Parrish or at 660.785.4515. Elyse Brisko from Moosylvania, an advertising agency in St. Louis, will give a presentation from 6:30-8 p.m. Nov. 21 in Baldwin Hall 176. Brisko is a senior art director and will speak on topics including Moosylvania, working in a competitive ad agency, personal and client brand, what they look for in college graduates, internship programs and more. This presentation is geared toward students with an interest in marketing, communication, advertising, visual communication and business. The Stargazers Astronomy Club will host an open house from 7-9 p.m. Nov. 21 at the Observatory at the University Farm.